For the greatest assurance in precision prop repair and service, our experienced professionals are trained to use Hale MRI technology. We work hard to ensure that your prop is returned to maximum strength and performance through proper and progressive restoration methods. We at Sante Marine take pride in providing you fast, top quality service. Why select an MRI Shop? Trained MRI shops are staffed by propeller repair professionals, with years of experience and repair skills. The Hale MRI is an precision instrument that gives the shop accurate information to enhance their repair capability. Repair with MRI creates a detailed report of propeller condition. Both the shop and the boat owner have a clear reference for the future. Once desired performance is obtained, future repair or manufacture can match and restore your prop according to the individual MRI file. Is your propeller custom designed? The precision MRI system is necessary to fully integrate sophisticated design and permit correct repair. The MRI system can recognize and apply original design data supplied by the propeller manufacturer. 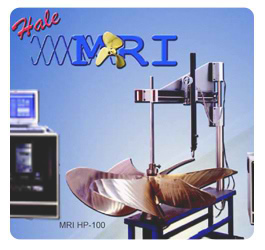 The Hale MRI can also interpret the original inspection reports typically supplied with full custom propellers.